The system of MAF examinations, developed through years-long experience of studying karate in Japan allows everyone to achieve a profound mastery through intensive work, regardless of the natural data. Gradually, step by step, along with improving techniques, the students strengthen their muscular, nervous and cardiovascular systems. Monitoring of techniques mastering is conducted at qualification examinations, where students validate certain kyu. Such examination is a kind of mandatory report of the trainer and his students on the work they have fulfilled. Examinations take place 4 times a year - in March, May, September and December. Certificates of international class got by the members of MAF are recognized throughout the world. Mastering the techniques of Shotokan Karate-do and passing qualifying examinations is impossible without knowledge of the Japanese terms that are used both during training and in international communication. That is why their studying is a prerequisite for every student. At this stage, students gain some preliminary insights on movement performance. Attention is attracted not to the speed and strength, but to the correctness of the final stands, strikes and blocks, giving the basis for further studying of more complex movements. At this stage, the in-depth study of the technique of elements performance begins. The demonstrated movements should be fluent and continuous. Proper positioning of body weight in standard stands helps coordinate movement. In the final phase, the muscle tension is evident. The degree of element acquirement is brought to the level of resistant automatic skill, allowing the students to perform the elements of movements in different conditions (federation and regional championships , field demonstrations, etc.). At this stage students develop the speed, kime in the final phase and proper coordination, coherence between tension and relaxation during techniques performance. All actions are aimed at studying versions of elements performance, more complex techniques, similar to the previous ones, but in more difficult execution environment (the Ukrainian championships and international competitions). 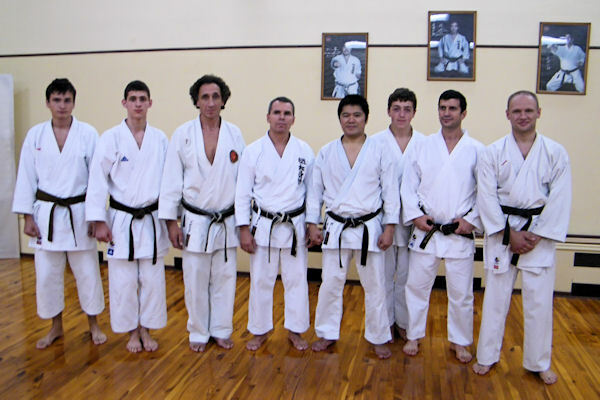 Copyright © 1995-2013 WWW.KARATE.LVIV.UA All rights reserved.